It seems like an age ago that A and I decided to hot foot it away for a weekend by the coast. 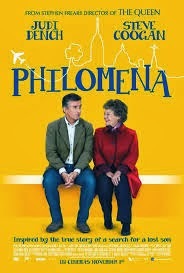 We settled ourselves into the small cinema next to our B&B and selected Philomena for our viewing pleasure. Philomena is based on the book by Martin Sixsmith (The Lost Child of Philomena Lee), which outlines the true story of Philomena Lee whose son was taken from her when she gave birth in a convent for fallen women in Ireland in 1952. Her son was adopted against her will, by Americans in exchange for a hefty donation. In 2004, Philomena's daughter approached journalist Martin Sixsmith in the hope that he might be able to help her mother locate her son, after some 50 years of fruitless searching. The film focuses on the relationship between Philomena (Judi Dench) and Martin (Steve Coogan), as they began to chase down the woman's long lost son, in a quest which leads them to Ireland, America, and the White House. This is a film which could easily have been overly sentimental, given the emotionally wrought subject matter. However, in the hands of screenplay writers Steve Coogan and Jeff Pope, it's surprising how many times I found myself chuckling. Dench and Coogan play opposite one another perfectly as the mismatched couple pushed together by circumstance. The characters were developed well, and it was gratifying to see Martin's respect and empathy for Philomena grow as the film progressed. While the story is incredibly sad, Dench's down to earth, nuanced portrayal of Philomena, focused the audience on the woman behind the dramatic circumstances; a person who is wonderfully ordinary, someone we can relate to. We've come to expect this level of performance from Dench and she deserves her place among the Best Actress Oscar nominees this year. With regards to its nomination for Best Picture, I wouldn't mind if such a film won. It's hard to think of anyone who wouldn't find something to enjoy in its muted humour and sincerity. I don't think it will win (I'll make my prediction in due course), though it'd be great to see it pick up Best Adapted Screenplay.